"Two young couples are driving through a remote forest when their car breaks down. 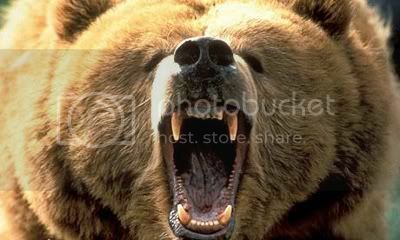 When a run-in with a curious grizzly bear ends up with the bear being shot to death, the bear's mate arrives on the scene and vengefully attacks their van." Continuing my season of horror films which I've never seen before, I decided to watch this animal revenge story featuring the least menacing grizzly bears ever. I don't know why exactly it is that Americans find bears so terrifying especially as you are hardly ever like to see one inside your parents' basement. If you do leave your comfort zone and head off out into the woods, you probably won't see a bear anywhere either as they are mostly shy creatures who tend to avoid humans unless they are desperate for food. Even though I've heard rumours that there are bears all over the place where I live, I've never seen one in four years and I've been looking hard. It will probably happen on the one day that I don't have a jar of honey with me too. But I suppose you want to know about the film? The IMDb synopsis which I quoted at the beginning really gives it all away. What that brief description of the plot doesn't tell you is that the couples in "Bear" are the annoying, bickering kind who do nothing but talk about their uber important relationships all the way through while either hiding in an old water pipe or their car as the vengeful bear attacks them over and over again like a bigger version of "Cujo". The characters are also absolutely hateful cowards who are over eager to shoot the first grizzly bear at point blank range about a dozen times but, fortunately, for those of us who love justice, they have no idea that you are supposed to stand your ground and make yourself look as big as possible instead of running away with your arms flailing everywhere when they encounter the second bear. Make no mistake about it, "Bear" is a terrible film with no scares, gore or excitement. The ending makes no sense either as the two brothers just decide to sacrifice themselves to the bear in an act of atonement without even thinking of offering the contents of their tasty pic-a-nic basket first. At just over an hour and a quarter long, "Bear" is a mercifully short film but still an hour too long for what it tries (and fails) to accomplish.